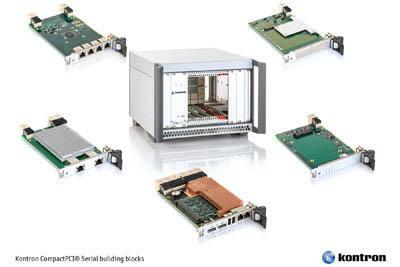 As part of its 'High-Speed CompactPCI® Initiative', at the Embedded World 2013 trade show in Nuremberg, Kontron is presenting a 3U CompactPCI® Serial (CPCI-S.0) compliant chassis platform as well as peripheral boards for 10 Gigabit and Gigabit Ethernet, XMC-based I/O and SATA hard disks. These building blocks are already aligned to the new Kontron CPS3003-SA processor board featuring the Intel® Core(TM) i7 processor, so that pre-integrated modular CompactPCI® Serial system configurations with PCIe, GbE, USB and SATA over backplane are also available to OEMs. Customers will also benefit from a rapid time-to-market and minimal integration efforts, which Kontron can also provide as part of its accompanying service program. 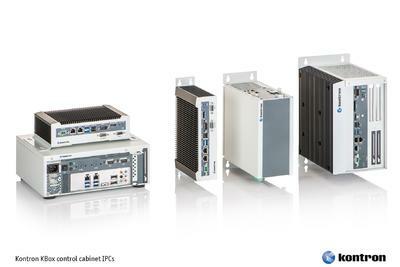 The Kontron chassis family CPS-ASM4 is a range of 19" (84HP) or 42HP rack/wall-mount or tabletop enclosures, pre-integrated and EMI tested including backplane, power supply and fan tray options for 3U CompactPCI® Serial installations. 5-slot and 9-slot variants are available. 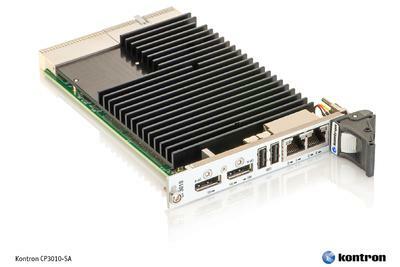 A 19" hybrid solution includes 5 CompactPCI® serial slots and the assembly option for up to four additional classic CompactPCI® extension boards. With these platform solutions Kontron supports both the all-new high-speed system configurations and also provides a simple migration path from the classic CompactPCI® to CompactPCI® Serial. Thus, users can transfer their systems into the serial world comparatively easily without having to take existing CompactPCI® peripheral cards out of service. OEMs can leverage the new Kontron dual port 10 Gigabit Ethernet board CPS3402 to equip their applications quickly and cost-efficiently with latest 10 Gigabit bandwidth. The new network board features the dual 10 Gigabit Intel® Ethernet Controller X540 and incorporates two copper interfaces on the front. Existing infrastructures with common CAT6+ cables are sufficient to establish 10 Gigabit interconnects. By using a PCI Express x8 interface to the backplane, the new Kontron CPS3402 delivers high transfer rates and an extremely efficient data throughput, as it unburdens the CPU by using intelligent mechanisms, such as Checksum Offload, TCP Segmentation Offload and reduced interrupt operations. The Kontron quad Gigabit Ethernet board CPS3410 provides four RJ-45 Gigabit Ethernet interfaces on the front panel. It is based on the Intel® Ethernet controller I350 and connects to the backplane via one x4 PCI Express link. The quad Gigabit Ethernet Controller provides a powerful set of features that include I/O virtualization and QoS features, Energy Efficient Ethernet (EEE), as well as support of Jumbo Frames (up to 9.5 KB) and the PXE boot option. Both the Ethernet boards, CPS3402 and CPS3410, support the current Windows® operating systems as well as Linux and VxWorks. 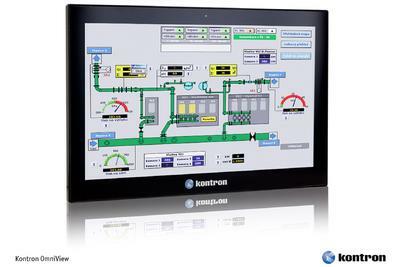 The Kontron CPS3105 is a 3U/4HP carrier for current XMC modules. The XMC carrier integrates a PCIe switch between the onboard XMC connector and the CPCI-S.0 system connector providing two advantages. First, it decouples and buffers the PCI Express signals and ensures highest signal integrity. Second, it is able to convert the x4 PCI Express 3.0 data stream from the system side into a x8 PCI Express 2.1 data stream to the XMC side, providing maximum data bandwidth to XMC modules based on PCI Express 2.1 which are commonly available. The Kontron SSD/HDD carrier CPS3101 functions as a carrier for one 2.5" HDD or solid state drive (SSD). Besides the onboard SATA connector (up to 6GB/s) it also integrates a USB 3.0 port, enabling the board to connect to system-internal USB devices. It is hot swap capable and has four LEDs on the front panel to indicate relevant status information of the carrier and the assembled drive. Application areas can be found in high-bandwidth RAID and storage systems for industrial imaging or video surveillance in public transportations and security. 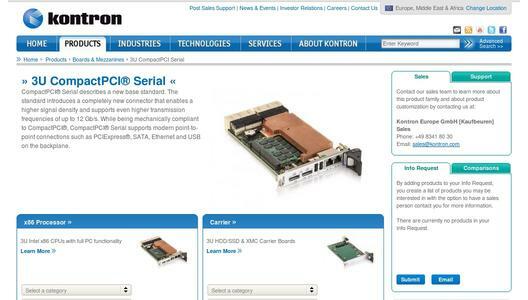 Kontron is a global leader in embedded computing technology. With more than 40% of its employees in research and development, Kontron creates many of the standards that drive the world's embedded computing platforms. Kontron's product longevity, local engineering and support, and value-added services, helps create a sustainable and viable embedded solution for OEMs and system integrators. Kontron works closely with its customers on their embedded application-ready platforms and custom solutions, enabling them to focus on their core competencies. 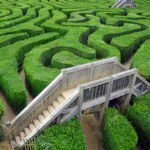 The result is an accelerated time-to-market, reduced total-cost-of-ownership and an improved overall application with leading-edge, highly-reliable embedded technology.